Congrats to our Top Realtors for September & Third Quarter of 2018! Thanks to everyone on our team for all your contributions for September and the 3rd quarter! 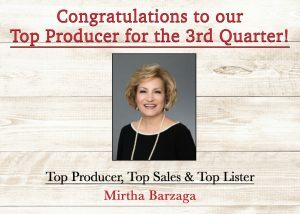 Mirtha Barzaga is our top producer for September with over $2.8 million in closings. Mirtha is also our top producer, top sales and top lister for the 3rd quarter. She is continuing her great year. Liz Pappaceno is our top sales agent for September. She takes such great care of her customers. It is wonderful to see her business grow.